Part 1 in the series. 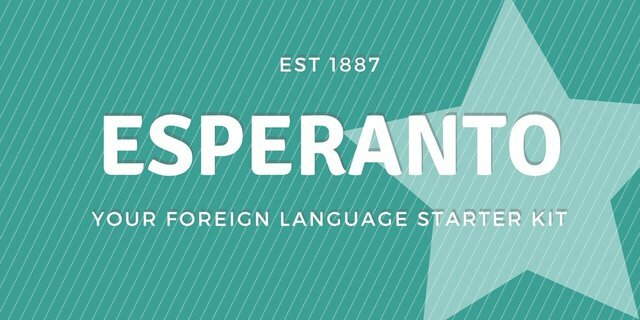 What is Esperanto? Part 2 in the series. Pronunciation and parts of speech. Verbs inspire language learners. Verbs crush language learners. I remember when the world opened up for me as a 14-year-old high school Spanish student. It was when we finally hit the Spanish 1 chapter on verbs. You see, in Spanish (and in many other languages) verbs are conjugated with regular endings. You take the infinitive verb “hablar” and remove the -ar, and add -o, making hablo. “I speak!” That was an epiphany for me. For many verbs, we take a set of word roots, change the ending according to a set of rules, and get a different word. I suddenly felt my vocabulary exploding while I soaked up new words. Now, when I memorize one Spanish verb, I get four to six words added to my vocabulary, with the help of the standard endings. Soon afterwards, I learned about irregular verbs. Spanish’s “I am” word from estar wasn’t esto like you would think, but estoy. While not optimal, the Spanish verbs were still pretty exciting for a young language learner like me. Then came more exceptions, and reflexive verbs, and multiple tenses, with irregular endings. Each new rule interacted with all of the others with some exceptions. Sometimes, even the exceptions had exceptions. As I delved further into my knowledge of foreign languages, some of my enthusiasm fell away. Language learning is hard! In 1998, I stumbled on an Esperanto language learning site, after having heard about it a few years before. As I started to explore it, I got many of the same feelings I had when I first explored Spanish. I found Esperanto pronunciation to be phonetic, much like Spanish. For every word I learned, I learned multiple others. The difference? There were no exceptions, and conjugation was much simpler. I didn’t feel like I was getting lost in the weeds with learning layers of exceptions. Verbs were much easier! Let’s take a look at a present-tense verb in English, one that we learned in Esperanto in the last chapter. Let’s look at it side-by-side with Spanish, French, and Esperanto. You probably get Esperanto present tense verbs without me even explaining it to you! But to make sure you really understand, let’s go over it in fine detail. Strap yourselves in! We’re about to learn all of the ways to make basic present-tense verbs in Esperanto. Now you can take any verb ending with -i, and convert it to present tense. The good news is past tense, future tense, and the command form are almost as easy! You’ll be happy to know that all Esperanto verbs are like this. No exceptions! Can you fill in the following table with the proper conjugated verb? Cheating is allowed. Refer to the text above if you need help. I’ll check your answers if you type them in the comment box below. A couple of weird snags with verbs. I’d like to talk about a couple of nuances about verbs in general, not just Esperanto. And I’d also like to touch on how English is generally different than Esperanto. Firstly, in English, we do verbs a little strangely, in my opinion. In ordinary conversation, we use a helping verb—a form of “to be”—and a participle. More often in English you would say, “I am swimming” instead of, “I swim.” You probably say, “I’ve eaten” instead of, “I ate.” Know that there are some rules to create interesting and very nuanced Esperanto participles, which will allow you to convey very specific tenses like “something going be finished the future.” But communication is the act of getting an idea across, and I think it’s probably best to just stick with the simple -as, -is, -os, and -u endings for now. You will get 95% of your Esperanto mileage out of those endings. Plus, those are the easiest for me personally to understand. Regardless, I will get to Esperanto participles in a later chapter. Secondly, in Esperanto, like many languages including English, there are a couple of different kinds of verbs: Intransitive and Transitive. That’s just fancy grammarian-speak for, are you doing this action to a thing or not? For example, if I use the English word make, and say, “I make…” —your brain expects a direct object after that, and asks, “You make what?” Make is a transitive verb, and it expects a direct object to come after it. You could also say, “I swim.” That’s perfectly fine! Swim doesn’t need a direct object. You can’t really “swim something.” Swim is generally intransitive, because it does not use a direct object. Esperanto is a little more rigid with regards to transitive and intransitive verbs. So, I suggest that when you learn an Esperanto verb, you learn if it takes an object or not. Your ear will soon learn when there is empty space after a verb that needs something else. One sure-fire way to do this is to start using a real-live online Esperanto dictionary! You can do it; this is not rocket science! You probably won’t be able to understand all the words at first, but one thing that will jump out at you with verbs is the key abbreviation: tr (hover-text “transitiva”) or ntr (hover-text “netransitiva”). If we look up the word helpi we find out that it is “transitiva;” therefore in Esperanto you have to always help something. That being said, just like in English, some Esperanto verbs are both transitive and intransitive. For example, in English, you can play something, or you can just play. Likewise in Esperanto, you can ludi (something) or you can just ludi. Note: There are some fancy endings in the Esperanto foreign language starter kit to magically transform a verb from transitive to intransitive, or vice versa. I will save that for another lesson! Just know that they exist, they are powerful and cool, and we’ll get to them soon! What took me years to learn in high school Spanish—verbs including all tenses and conjugations for past, present, future, and command—I was able to teach you in under 15 minutes. Jen la potenco de Esperanto! Behold the power of Esperanto! In the next chapter, we will be putting some sentences together! You’ll be fluent in no time. I'm a parti-time professional magician and mentalist! Hire me! And join me in @steemgigs, and @steemfreelancers ! Mi lernas Esperanto kun mia edzino. Saluton amiko. Kiel vi fartas? Ĉu vi jam iom sukcesis kun via Esperanto- lernado? Kion vi pensas pri mia lasta artikolo koncerne Esperanton (engl)? Thanks, Plushzilla! I will start adding those flags in the future. I wasn't really sure what hashtags to file it under, to be honest. I'm still a somewhat newbie Steemit user! Saluton amiko. Hodiaŭ mi vidis, ke vi votis mian lastan artikolon. Dankon pro tio. Ĉu vi ne plu emas verki en Esperanto? Ĝi ankoraŭ estas iom magia! Jes! Tamen mia plej juna infanino diplomigxos el la usona altlernejo la sekvan monaton. Do, mi havas malmultan sxpartempo por mia Esperanto-projekto kaj Steemit. Espere mi relancxos la serion baldaux, post la diplomo-ceremonio kaj posta festo. Ĉion bonan por via infanino. Ĉio laŭ via plaĉo, kompreneble! Fartu bone!